Clears tough blockages in all industrial, commercial, recreational and domestic drainage systems. Immediately attacks the source of the blockage even through standing water. 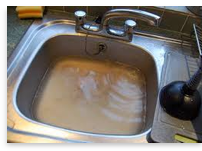 Removes food greases, proteins, body hair, soap scum, body fats and other contaminants that cause blocked drains. and is a safer alternative to sulphuric acid based products which cause fumes and violent reactions in drainage systems. Simply pour into the blocked drain and leave for 15 minutes or until the drain starts to clear. Flush with hot or cold water until the drain runs free.